Loaded Bacon Ranch Potato Salad. 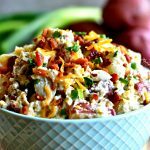 A creamy potato salad made with a homemade ranch dressing, bacon, cheddar cheese, hard-boiled eggs and green onions. All of your favorite flavors from a loaded baked potato. A perfect gluten-free creamy potato salad for your next cookout or family get together. A summer classic that everyone will love! Rinse potatoes and cut into bite-sized pieces. Add the potatoes to a large pot and cover with water. Cook on high and bring to a boil. Once boiling reduce the heat to medium and boil for 12-15 minutes or until the potatoes are tender. Check with a fork to see if potatoes are cooked to your liking. 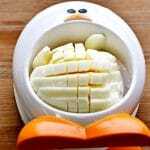 Drain the potatoes and rinse with cold water. Add the potatoes to a large bowl and put them in the refrigerator to cool while you are making the dressing. In a small bowl add of the seasonings together and give it a quick whisk or stir to combine. This is your ranch seasoning blend. In a medium-sized bowl add the mayonnaise, sour cream (leave out if dairy-free) and ranch seasoning blend. Mix until fully combined. This is the homemade ranch dressing for the potato salad. Add the homemade ranch dressing to the chilled diced potatoes. Carefully stir to fully cover the potatoes with the ranch dressing.